Some poets begin very early to write great poetry. Arthur Rimbaud wrote one of his best poems at 15, Percy Shelley published his first book of poetry at 18. But Kilian McDonnell, O.S.B., did not start until he was 75, after decades of writing as a professional theologian. Now 82 he gives us Swift, Lord, You Are Not, poems of the struggle to find Godwaiting for the silence of God to break. He does not write pious verse, or inspirational poetry, but of wrestling with the illusive God. His themes are mostly biblical and monastic. He closes with an essay "Poet: Can You Start at Seventy-Five?" in which he describes the literary decisions he makes within the monastic contextdecisions he needs to make with some dispatch. At 75 he does not have decades to mature. He writes with a new language. Autographed copies of this book are available upon request. Please indicate in the comment box when ordering if you would like an autographed copy. Kilian McDonnell, OSB, STD, is a priest and monk of St. John's Abbey, Collegeville, Minnesota. He is author of John Calvin, The Church, and the Eucharist (Princeton and Oxford University Presses) and The Baptism of Jesus in the Jordan, and the forthcoming The Other Hand of God: The Holy Spirit as the Universal Touch and Goal, published by Liturgical Press. He served as the Consultor to the Vatican Pontifical Council for Promoting Christian Unity, and is the founder and president of the Institute for Ecumenical and Cultural Research in Collegeville, Minnesota. He is the recipient of the John Courtney Murray Award for Significant Contributions to Theology, given by the Catholic Theological Society of America, the James Fitzgerald Award for Ecumenism, and was the recipient of the papal award for ecumenism from Pope John Paul II: Pro Pontifice et Eccelesia. 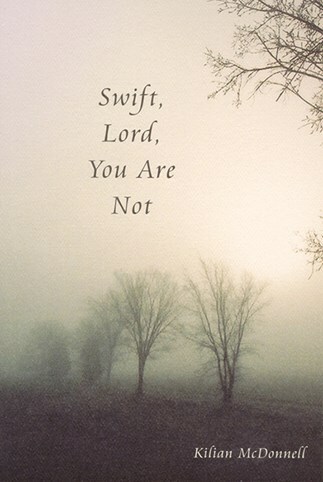 Swift Lord, You Are Not provides us with meaning and inspiration, enjoyment and refinement of the heart. It deserves at least two if not three readings. [M]asterfully crafted, and totally engaging. . . . McDonnell is a genius at inserting some of the latest contemporary idioms and realities into biblical scenes-a maneuver that brings the reader's attention to `an upright position,' squashing any patronizing attitude one may be harboring with regard to the poet's age and environment. . . . [H]e retains his tremendously refreshing sense of humor, his ability to poke fun at himself, the twinkle in his eye, and his delightful obstreperous verve. His is a voice worth listening to. I want to hear more. McDonnell has started late at poetry, but he should keep going. Why stop now?